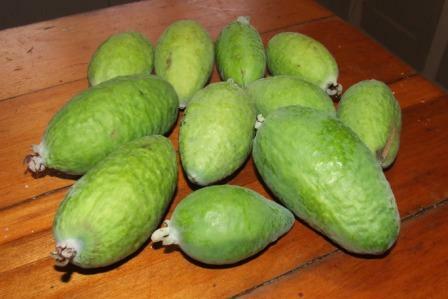 I am pleased to announce that I am finally getting a fabulous feijoa crop again. After a couple of years of snowfalls that repeatedly damaged my five small feijoa trees, I have managed to coddle them back to a happy, productive state. I am also quietly pleased that my trees are doing better than my neighbour’s ones. The recipe for my fabulous feijoas is somewhat as follows. Hard pruning. This promotes fresh, bushy growth and also counteracts the distinct and utter lopsidedness that snow can inflict upon a feijoa tree. Tie the trees to the fence when it snows. This did not occur to me until the last snowfall. Ha! Try to break those branches now Mr snow! Have a diligent husband. 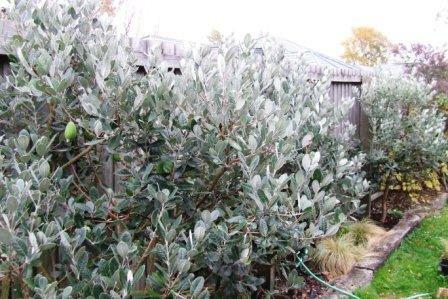 If you are fortunate, you will have a husband who is at home during snowfalls, and while you are at work, he will kindly shake the snow off the feijoa trees at regular intervals. Fertilise your trees. Do it regularly. I use a granular citrus fertiliser. Water your trees. Make sure they get a nice deep watering every now and then, especially during hot summers. Add horse pooh. Putting a layer of well-rotted horse pooh on the soil is like giving your trees an invigorating, luxurious mudbath. Except it’s free. Now I am enjoying the fruits of my labour, all the while keeping an eye out for Mr Snow.